Over the years building blocks like Lego and Mega Bloks have come out with all sorts of licensed sets. Movies, cartoons, games, comics, and sports have shown up in one brick from or another. While there have been a few surprises down the line, I feel I have a pretty good grasp on what is happening in those toy lines. 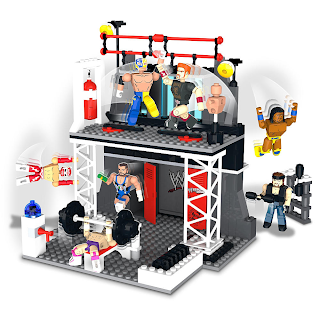 I was completely surprised to learn about the WWE Stackdown sets and even more surprised to find out they were already showing up on the shelves of toy stores. 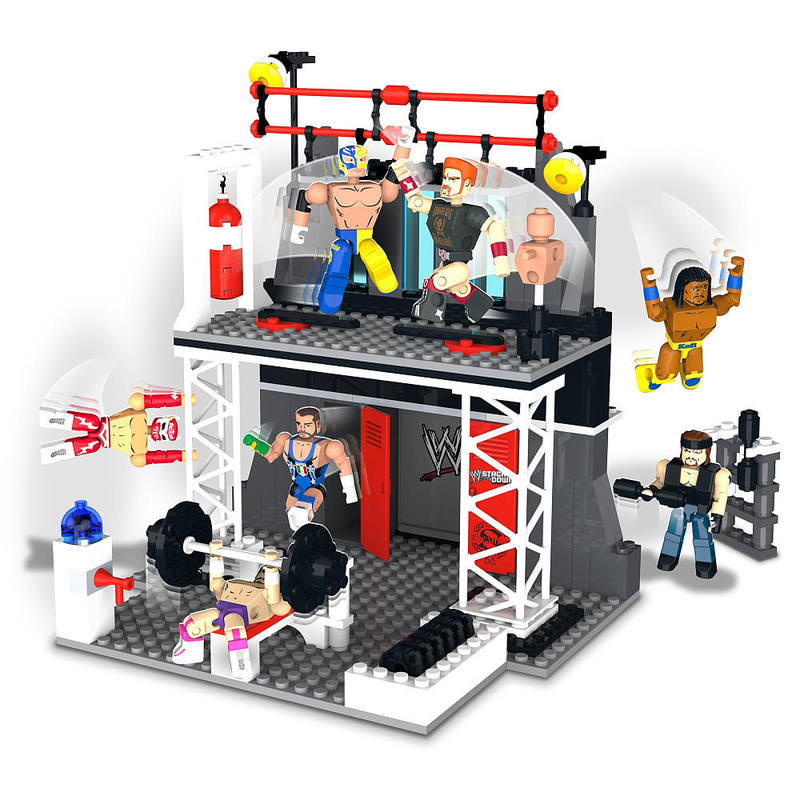 Obviously when you think wrestling you think about building blocks; it’s a natural combination. Well that’s not true on any planet I’ve been to. That doesn’t mean that the sets can’t be a lot of fun though. 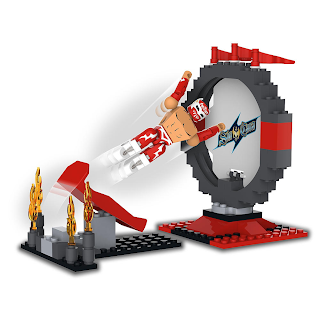 The flagship of the series launch is the Train and Rumble set. 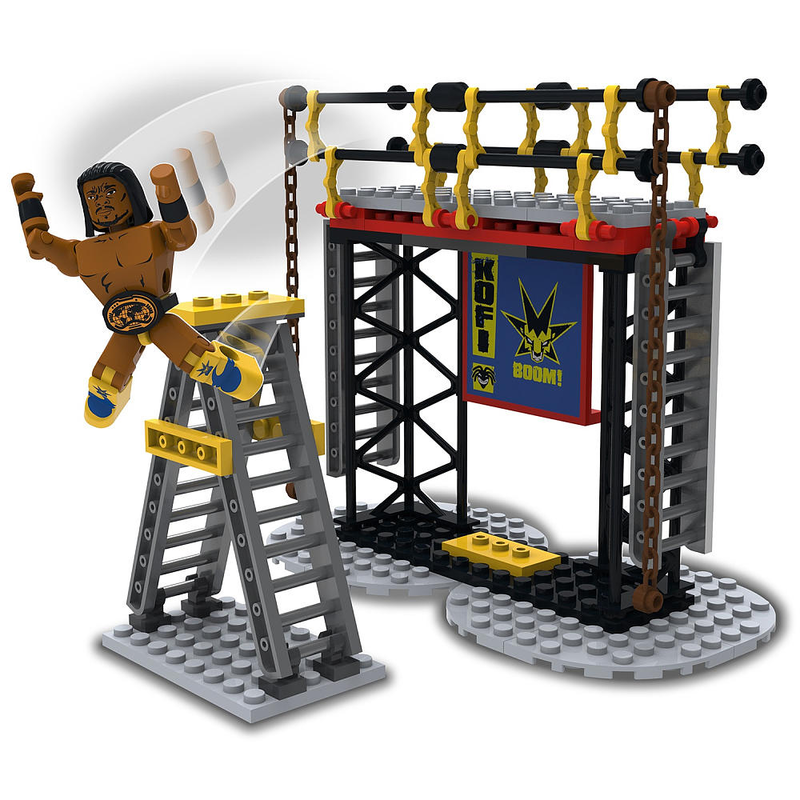 The two story set has plenty of workout gear for your wrestlers to train with. Have your wrestlers throw each other into a locker, weight bench, or off a scaffolding. It also comes with Rey Mysterio and Sheamus figures. Sin Cara comes with a figure catapult, a giant ring to jump through, and some torches that are probably meant to represent pyro. So you pretty much are given props to create a Sin Cara entrance. I can’t imagine that adding a lot to the value but the figure is the real star of this pack anyway. Considering the original Sin Cara's track record they really should have packaged him with some medical supplies. Maybe a wheelchair or a stretcher. Kofi Kingston actually comes with some things that can be used. His set includes scaffolding, a ladder, and he comes with a title belt. Want to put on ladder matches with your figures? You’re going to have to get the Kofi set. What to have a title belt? You’re going to have to get the Kofi set. Out of all the sets, this is the one that seems the most wrestling related. In fact the other sets just start to get weird. Damien Sandow, the intellectual savior of the masses, comes with an office. Seriously he comes with a chair, a table, and a presentation board that has one of his shirt designs on it. He also comes with a microphone, a must have if you want your figures to cut promos on each other. The table is not meant to be used during your matches because it doesn’t even split in half. Then we have Santino. I get that Santino is used as a comedy gimmick. The man’s sense of humor and timing are great. His set comes with a giant cage that he and a cobra can fit into. Yes his finisher is called the cobra but he isn’t carting a real cobra out. And why would he go in the cage with a cobra? I’m very confused by the whole thing. Finally is the Undertaker set. He’s the biggest name attached to any of these sets so it isn’t surprising that it looks cool. It is an odd mix of Undertaker images though. 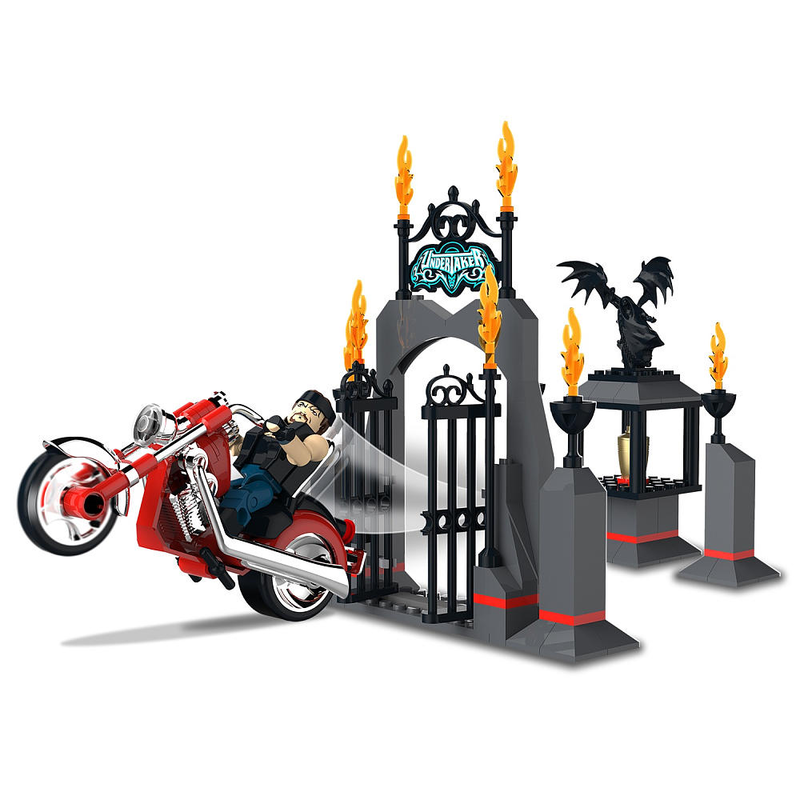 The set has cemetery gates and a funeral urn that has been used in many of the Undertaker’s stories. If you package these items with a demonic looking Undertaker it makes sense. Instead you get “American Badass” Undertaker riding a motorcycle. 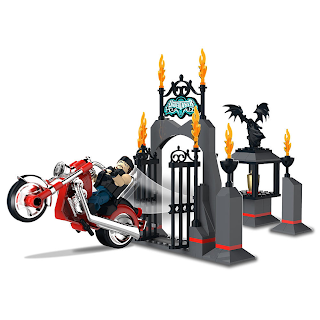 The figure and bike on their own do represent a version of the Undertaker; they just don’t go with the other accessories at all. That’s it for the first wave of Stackdown. There were some seriously strange decisions made when designing these sets. I hope they take off enough that we see at least another wave, because I can’t wait to see the oddities they come up with for wave 2.